Three years ago, Charles Anschutz and Chris Nelms attended a wrestling event and thought they could do it better. They wanted to make wrestling like it used to be – an intimate, family-friendly experience for the fans with some of the best talent in the country. After much planning and action, Anschutz and Nelms were able to make this dream a reality when they held their first show at the American Legion in Monroe, Georgia, and Southern Fried Championship Wrestling was born. Justin Legend, Buddy Burke and Chris Nelms pose for a picture at the meet and greet fan event at the Harrison Rd. Walmart prior to the show. Photo by Steven Hodges. Now, SFCW holds regular shows at the Nowell Recreation Center in Monroe. As many as 500 fans have attended these events. SFCW has featured many legends of wrestling such as Scott Hall, Sabu, and Tommy Rich as well as up and coming wrestlers like Luke Gallows, now in WWE, and Moose, who recently made his Impact debut. The current SFCW roster is packed with talent that could be the next household name in wrestling. Macon Mayhem on July 23, 2016, was the first time SFCW has held an event in Macon. 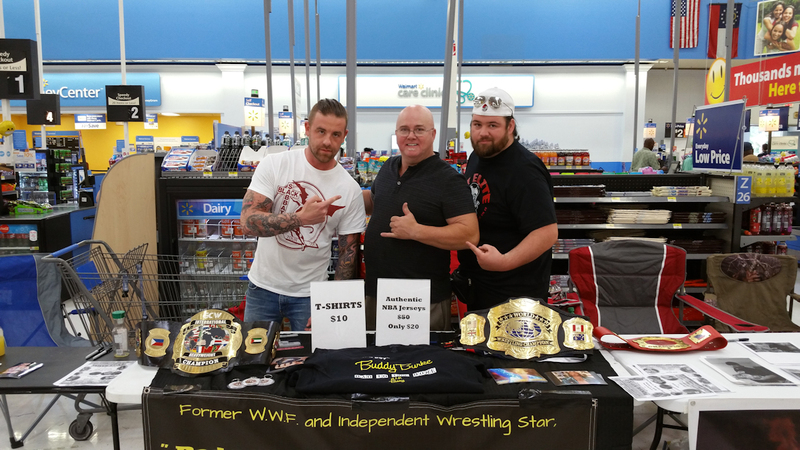 The Macon Mayhem event kicked off with a meet and greet held by SFCW at the Walmart on Harrison Road. There, fans could meet a few of the wrestlers that would be working at the show and get their autographs and pictures. Also, merchandise and specially priced tickets were available. Former WWF wrestler and 30 year veteran, Buddy Burke, spoke passionately about the business, saying it was more addictive than anything he knows. Being able to control the emotions of the crowd in the palm of your hand is a feeling that never goes away. Although Burke wrestled his last match in October, you could still see the fire in his eyes and hear the intensity in his voice. One of the things that drew him to SFCW was that its goal was to make the wrestlers accessible to the fans. School teacher by day, Justin Legend made the transition from mixed martial arts to pro wrestling three years ago and has not looked back. He also has physical evidence of just how committed he is to the business. Justin rolled up the leg of his pants, revealing a scar that nearly ran from his knee to his ankle. Last year, he broke his leg and required eight operations in a four month span. Doctors told him that he would never be able to return to the ring, but that did not stop him. After much training and rehabilitation, his first match back was a no holds barred street match. Legend said that if he only had one match left in him, he wanted to go out in amazing fashion. “#HeelDaddy” Chris Nelms has been wrestling in the Middle Georgia area for the last ten years, the first five of which were under a mask. He said that in wrestling, you have to always evolve and tweak your character to keep up with the changing preferences of the fans. As for the show itself, Southern Fried Championship Wrestling had a ring set up in the rear parking of La Bamba Mexican Restaurant on Northside Drive in Macon, marking only the second time SFCW has been held outdoors. Thankfully, the weather cooperated and it did not rain. But, the near 100 degree temperature throughout the day definitely made it tough on the competitors. The first match of the night got underway just after 6:00 pm, featuring The Great Skrilla against Twisted. The bout started off as a display of technical skill as each wrestler plied their trade, but Twisted resorted to a few shortcuts in the match when the referee wasn’t looking. All of Twisted’s trickery wasn’t enough as Skrilla landed a side suplex that earned him the three count. However, sour grapes took over as Twisted pummelled Skrilla after the match was over. Next up was Drew Adler versus Odinson. Adler started the match by exiting the ring, attempting to filibuster the match, and outright running away from the gigantic Norseman. Adler was right run. Odinson, who looked like he was straight out of the Valhalla branch of Gold’s Gym, was thoroughly in control of the match until a miscue caused him to shoulder block the ring post. Drew Adler swept in to land a flurry of offensive moves, but in the end it was not enough as Odinson was able to regain control and get the pin. Fans were then treated to a tag team match as Zach Edwards and Michael Stevens, collectively known as the Beautiful Bald Besties, paraded down to the ring, donned in pink and purple polka dots. Their opponents were the Cruiser Cup Champion Damien Bennett and former Ring of Honor wrestler Sal Rinauro. The Besties used quick tags to work over Bennett, but as the crowd cheered him on, Damien was able to make the hot tag to Rinauro, who delivered a superkick to win the match for his team. Marvelous Marco then made his way to the ring and was quick to let everyone know that he was from every woman’s dream. The boos of the fans turned to cheers as The Upgrade Brian Kane of the Southern Fried Mafia made his way to the ring. Marco looked very strong in this match, but Brian Kane was able to take him down, much to the delight of the fans. 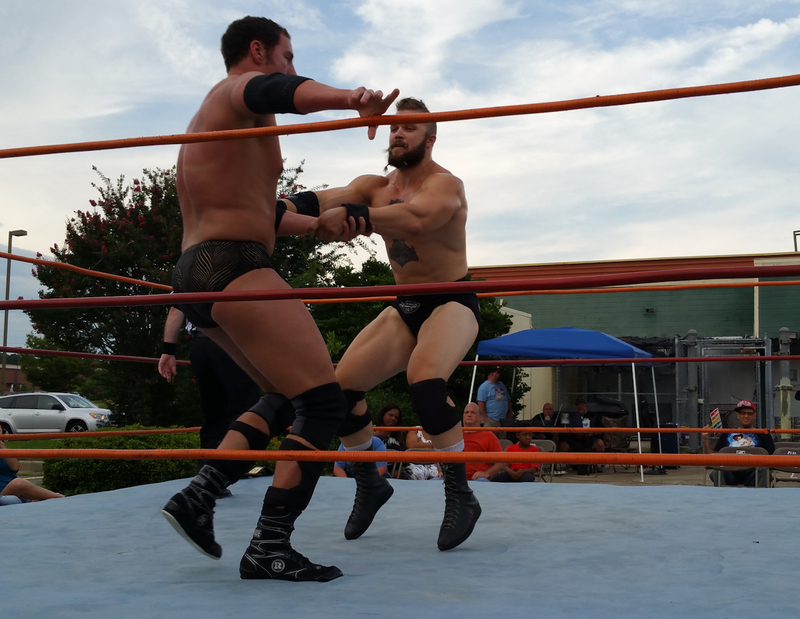 The next match was one that many in attendance had been waiting for – a taped fist match between Justin Legend and AIWF Georgia Heritage champion “#HeelDaddy” Chris Nelms. Nelms was accompanied to the ring by “The General” Tommy Allen Lee. This match was an absolute, out of control fight from the get go. The action quickly spilled outside the ring where Chris Nelms was busted open when Justin Legend whipped him into the steel ring post. Nelms and Legend fought back and forth outside the ring until The General interjected himself into the match by jabbing his cane into the throat of Justin Legend. Chris Nelms used this opening to work Legend over with a chair. Once the match got back into the ring, Nelms continued the offense. His momentum was only stopped by a jawbreaker from Legend. The General once again got involved in the match when he entered the ring and hit Justin Legend over the head with his cane. At this point, Buddy Burke had seen enough. He ran into the ring and gave Nelms a cutter to even the score. 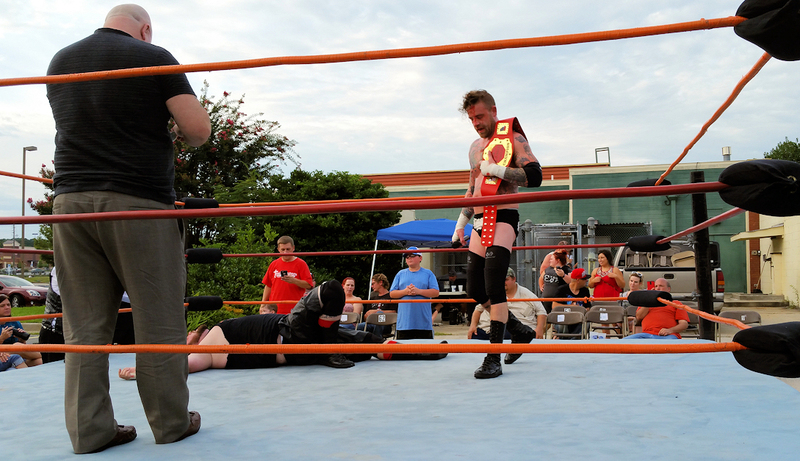 Justin Legend was able to make the pin and had his arm raised in victory as the new AIWF Georgia Heritage champion. The main event of the evening featured challenger, Trevor Aeon against one half of the SFCW tag team champions as well as the Monroe City champion, Logan Creed, accompanied by Miss Brooklyn. 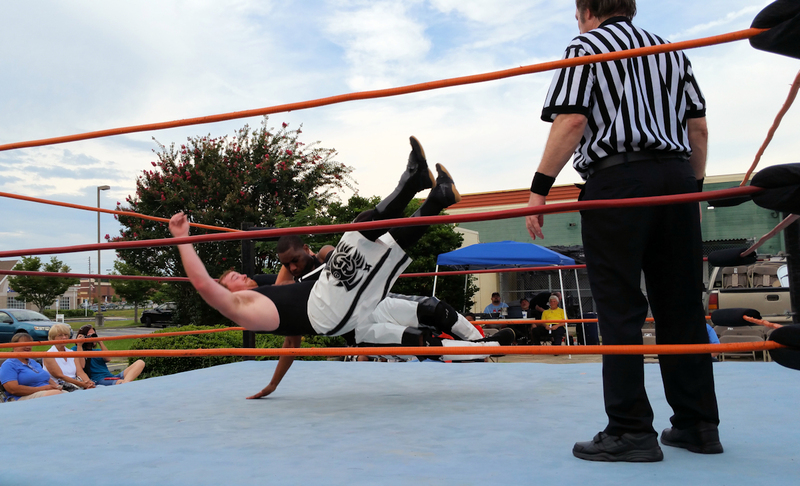 At nearly seven feet tall, Creed towered over Aeon, but the match went back and forth until the referee got a little too close to the action and went down. Aeon quickly used this to his advantage as he leapt outside of the ring, grabbed a chair, and planted Creed head first onto it with a wicked DDT to get a three count. This was the second title change of the evening as Trevor Aeon was crowned the new Monroe City champion. All in all, each of these athletes wrestled their hearts out and gave a performance worthy of a packed arena. The next opportunity to see SFCW is August 20 in Monroe, Georgia. But, they do have plans to return to Macon at La Bamba again in the future. Every single fan in attendance went home from the two hour show with a smile on their face. They were able to see world class wrestling up close and personal. While it’s easy to want to be a part of the action, please remember that these athletes are trained professionals and medical staff is always standing by should any of the wrestlers get injured. Note: The event was named “Macon Mayhem” and is not affiliated with the Macon Hockey team.